At the Juventus training center in Vinovo the last home match of the championship is played, Juventus must win to keep the top of the standings, but nevertheless everything will be decided in the next day of the championship. The Tavagnacco with mathematical salvation in his pocket arrives in Vinovo with a formation entirely composed of very young but quite talented and promising girls. However, it only takes ten minutes for Juventus to take the lead, Eniola Aluko shooting from the edge, slamming into an opponent and becoming an involuntary assist for the inclusion of Aurora Galli, the Bianconeri 4 number bags the ball, unlucky Buhigas who was positioned to repel Aluko's shot. The Tavagnacco is looking for a reaction to get the result equal, but it is still Juventus with a great southpaw from Cernoia who from the trocar touches the crossbar, a few minutes later the Tavagnacco becomes dangerous making Giuliani dirty his gloves. But after ten minutes Juventus is again on the net, with Eniola Aluko, the black and white 9 number with a cross-shot that beats Buhigas. At this point it is the Tavagnacco who becomes dangerous, on the corner the number 9 Polli strikes his head, a central shot rejected by Giuliani, but on the riveted defenseless goal is Gama to save on the line. At this point, however, it is Juventus who sets the set, again with Aluko hitting Buhigas at the top of the first half. At the beginning of the second half it was Tavagnacco who made himself dangerous with a cross from Erzen that hit the top of the crossbar and seemed to fool Giuliani. To signal the ninth minute of the second half the entry into the field of the "queen of Turin" Martina Rosucci that after more than six months from the bad injury to the ligaments returns on the pitch between the ovation of the fans. Be careful thoughexpulsion of Buhigas for a shot from Girelli to be out of area and then the referee draws the red card, on the free kick given by the foul of hands he shoots Cristiana Girelli who kicks the far post and the newly entered Piazza fails to reach her, Juventus poker at this point. But the match does not end here, Juventus is still dangerous with a great shot from distance by Arianna Caruso that ends very low, in the minutes of recovery comes the fifth Juventus goal again with Cristiana Girelli intercepting an assist by Barbara Bonansea who was destined for Martina Rosucci, in fact as soon as Girelli realizes he apologizes to his partner who wanted to crown his return to the field with a goal. 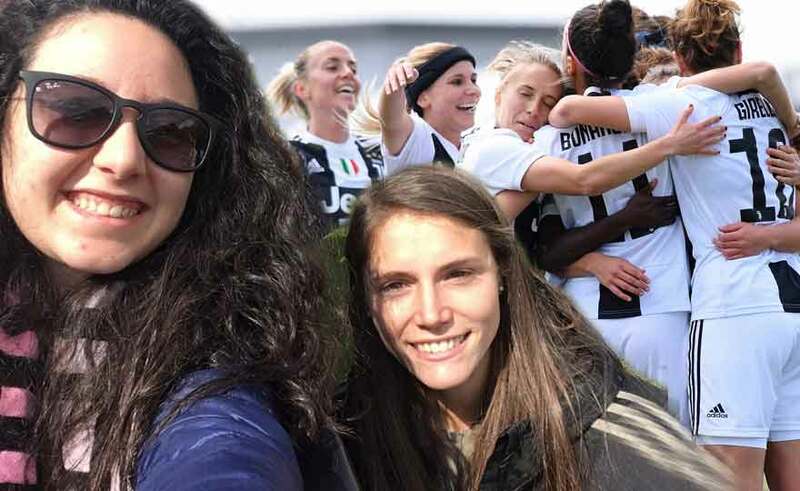 The match between Juventus and Tavagnacco ends before the approximately 500 Vinovo fans, with applause for the girls of both teams and numerous choirs for Cecilia Salvai who at the end of the game entered the field to greet her companions and fans. The final victory of the championship will be played throughout the next day when Fiorentina will host Roma, Juventus will play away to Verona against Verona while Milan will host Chievo Verona Valpolicella. To signal towards the end of the match the release of Marta Mascarello due to injury, we hope it will be nothing serious for her. Juventus: Giuliani, Hyyrynen, Gama (6'st Franco), Ekroth, Panzeri, Pedersen (9'st Rosucci), Galli, Cernoia (37 'Caruso), Bonansea, Girelli, Aluko. Available: Sanderson, Boattin, Sikora, Bacic. Tavagnacco: Buhigas, Donda, Frizza, Mella, Mascarello (30 'st Blasoni), Polli (19'st Piazza), Kollanen, Ferin, Erzen, Zuliani (9'st Fracaros), Errico. Available: Winter, Cavicchia, Bonassi, Pasqualini.